In a small bowl, combine first 3 ingredients for marinade. Remove 1/4 cup and combine with chicken in resealable plastic bag. Marinate in refrigerator 30 minutes or up to 2 hours, turning occasionally. Meanwhile, in microwave-safe dish, combine potatoes and water. Cover and microwave on high 9 to 10 minutes, or until just tender. Let cool. When potatoes are cool enough to handle, alternately thread with bell pepper and zucchini onto eight 10- to 12-inch skewers. Remove chicken from plastic bag, and discard marinade from chicken. Grill chicken over medium-low to medium heat for 30 to 40 minutes, or until juices run clear, turning occasionally. About 10 minutes before chicken is done, add vegetables to grill, and reserve marinade. Grill until tender and lightly browned, turning and basting occasionally with reserved vegetable marinade. 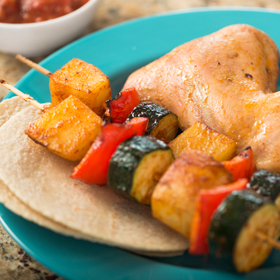 Serve chicken and vegetables with tortillas and salsa, if desired. *Nutrition information does not include optional ingredients. Serving size: 1/4 of recipe. Amount per serving: 482 calories (27% of calories from fat), 14.4g total fat (2.8g saturated fat), 56g carbohydrates, 33g protein, 8g dietary fiber, 157mg sodium.